And a lovely circle it is, Tif!! Well done! Every time my daughter attempts a flat circle, it becomes a cozy for a mug of tea!! No idea how she manages it, but Granny gets one every year for Christmas! Lovely circle! Fab book (now I have book envy)! How you have managed to get so much light in your photos on such a dark day I just don't know, very nice. I made a mad dash into the crappity crap thrift store nearby this morn. A whole giggly pile of yarn sat before me on the shelf, I looked furtively around me and grabbed. Sadly, as I waited in line I took a closer look, and more importantly a little sniff...the stench cannot be described without using vulgarity, so I will leave it to your imagination. It was beyond any fixing. 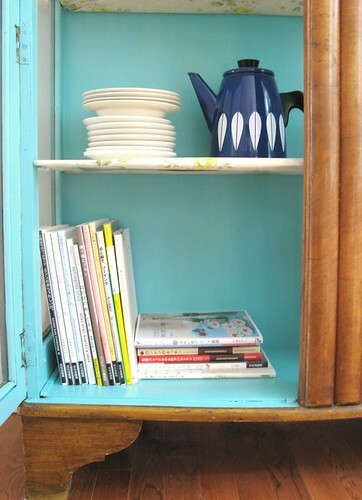 As I placed it back on it's shelf, a wee tear rolled down my cheek - from sadness perhaps, or lingering fumes. To have such a treasure in one's grasp and so cruelly snatched away - tis a terrible thing and I am still nursing the wound. and YOU are not helping! 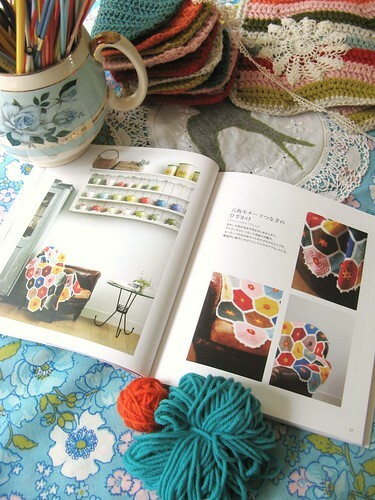 with your delicious colors and that BOOK! 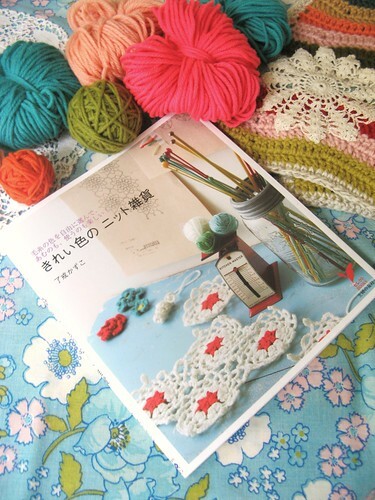 lordy, I've never had any real desire to crochet before reading this..I think I need that book! So lovely here, as always. Hi Tif, new to your blog, but love this post! I did a search for the ISBN but am coming up with nothing :( do you have a translation of the title? where did you get it? it's ADORABLE! what a lovely book. and such lovely yarn colors. perhaps i shall attempt a cushion cover for my little stool. Really, can Olive get any cuter?? I can see the caption now - "didn't do it"....Thanks again for yet another book I have to get - are the directions in English? If not I would be in a world of hurt since I'm not quite that talented yet to just go by a picture - but I would be willing to try. If I ever happen to see you out in the Seattle area with little Olive - beware of the crazy lady running up to hug your dog! Well done! I have just started crochet also - I am working on my first granny square - it's going to be a big one, because I am having so much fun and can't stop! 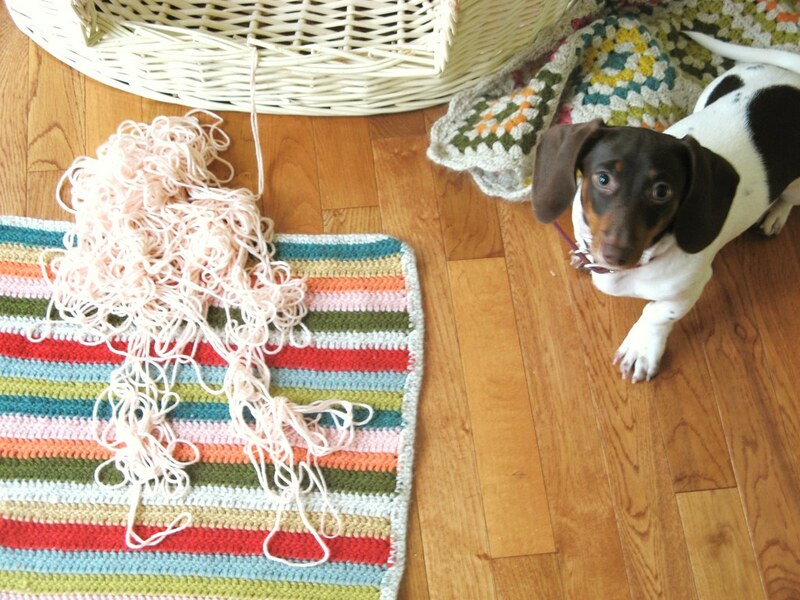 I think you have encountered Denise's 'Provider of All Things Second Hand' with your yarn! Those pictures (yours and the book's) are just wonderful. So happy that the thrifting gods smiled on you! Little Olive needs to swap tips with my BERT - who recently committed the Exact Same Crime with the wool, only he hid under the coffee table, ball of wool still in mouth (poking out the side), evidence all over the floor and tangled round his legs, with a "Wot Wool?????" look on his face. 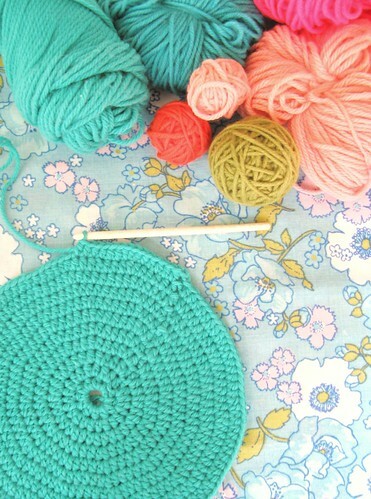 and your crocheted circle looks fabby too, there's no stopping you now... you're turning into a real crocheting mama! Welcome to the world of colour - in all its boldness and beauty. Your life will never be the same! 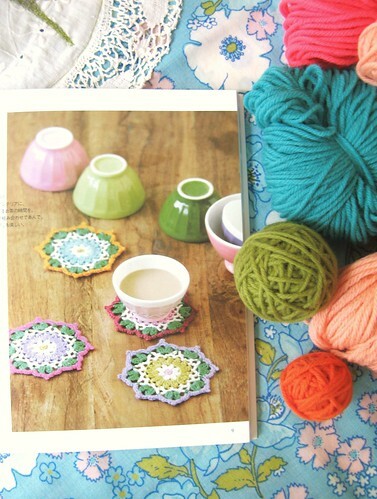 I can't knit or crochet but I do lust over that beautiful book, hhmmm pretty pictures to look at! As I said I don't crochet and am very impressed with your circular circle, i'm sure if I did attempt it would be far from circular! What an absolutely deliciously lovely post. Yes, I am having the same yarn thing going on. I searched for 2 hours online looking for the best price on Manos del Uruguay for a scarf I want to knit. That is one very beautiful book! What a good story, and oh... the book! 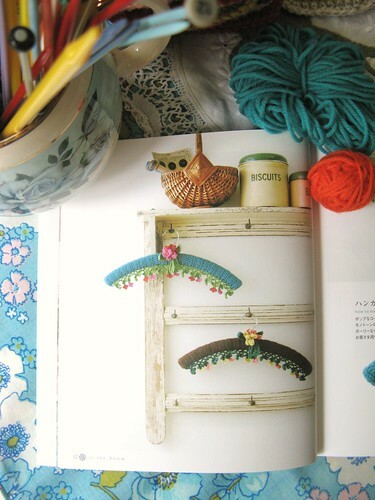 I'm not even a crocheter and I already go crazy when I see those pages! And hurray for your good karma! You can always buy hand spun yarn from Etsy, no? Handmade is OK for this challenge! love the colours - so inspiring! thanks for the suggestion... i appreciate it! 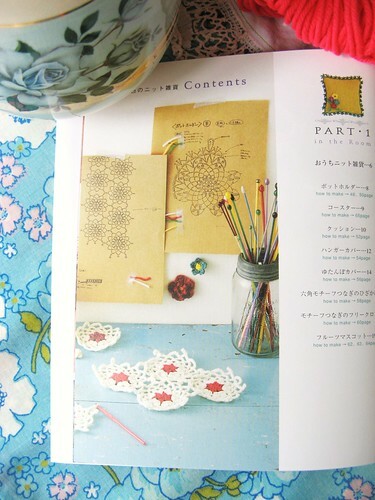 I LOVE your photos and LOVE your write up in the latest Artful blogging magazine. how wonderful to get a call from them did you ever find out how they came across your blog, btw? I have to ask you one thing--in your article you state you have an later ego who homeschools with 8 kids and then you say later that the blog keeps you real and you can be yourself? Explain please if you would be so kind? That stumped me. Anyway, regardless, beautiful stuff here and always nice to meet another ex-pat. BTw, if would be very helpful if you had a way to follow you on your sidebar as well. I'm so glad you're finding some yarn Karma at the mossy shed. Nothing worse than yarn lust, other than no yarn at all! Thanks for your inspirations! What a lovely book! The layout & photography, superb! I am going to try and get hold of one if I can. this author, kazuko ryokai is one of my favourite(shes famous in japan), and she has lots of other fantastic books that you can get online. 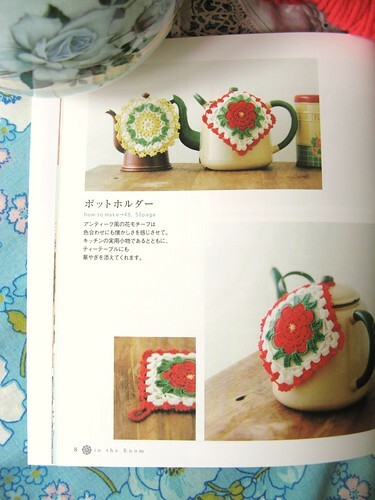 ive heard that she likes cath kidston's fabrics too. 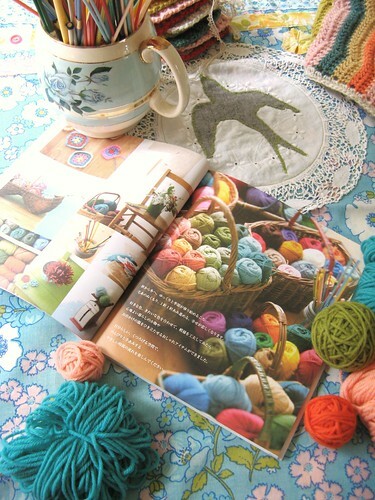 i love your pictures, the colours of yarns are really pretty. Felicidades por tu circulo azul, me he alegrado de leerte, yo tambien tengo un diablo sobre mis hombros Cuando entro en una tienda de lanas y no siempre puedo alejarlo. Pero ... que mas da Mientras PODAMOS hacer circulos planos!